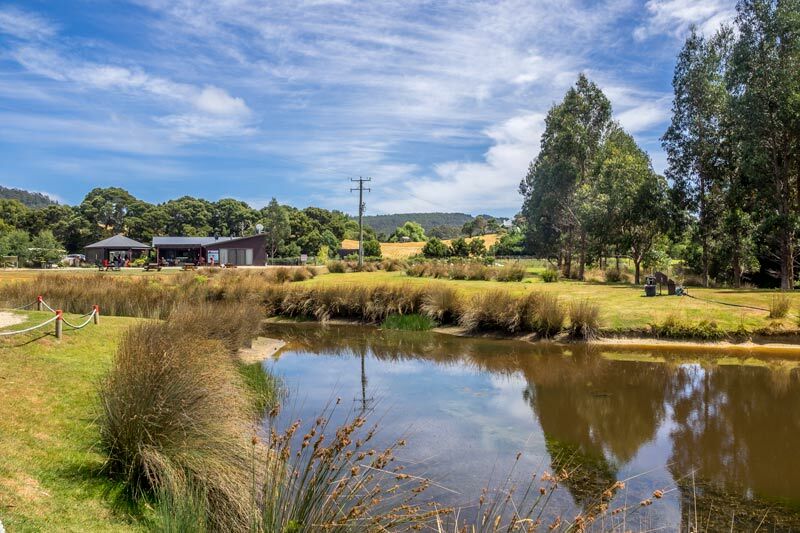 Bruny Island is a treasure trove of fresh produce and artisan producers. 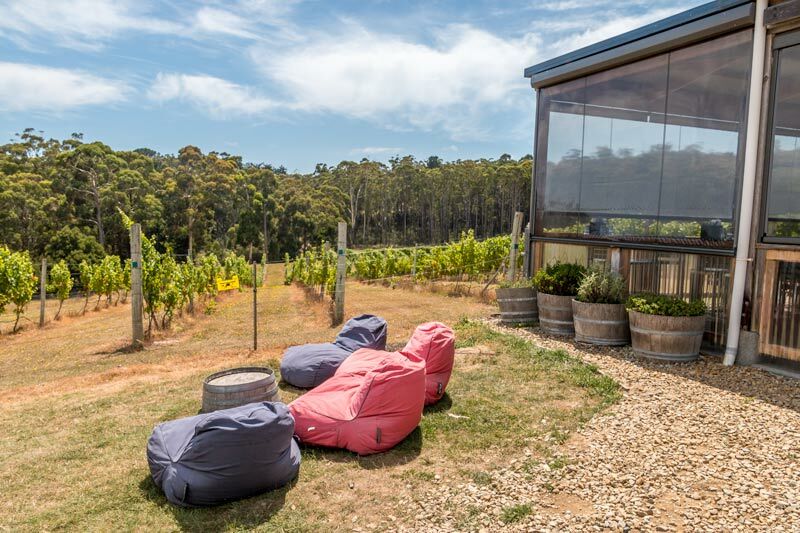 Located just over an hour from Hobart CBD it’s an ideal weekend escape for locals and a must do for the travelling foodie. 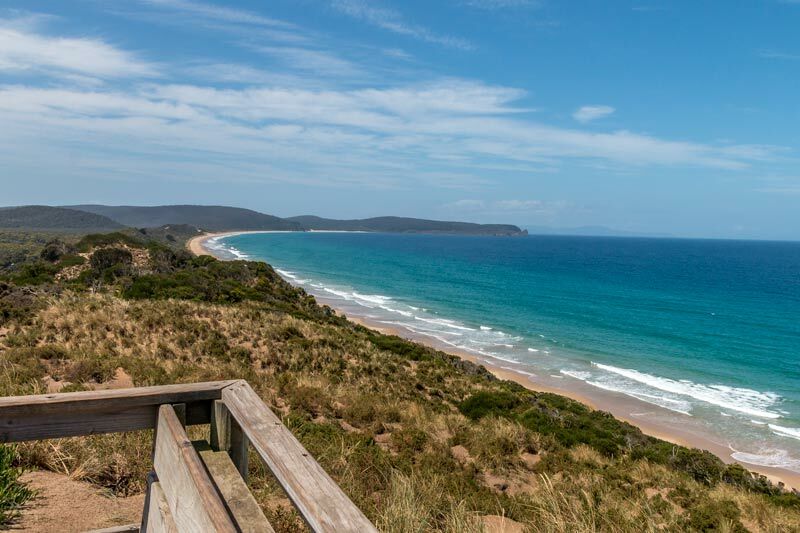 Here’s our top tips for planning your Bruny Island day trip. Tasmania had been on our wish list for ages but it always seemed so remote and expensive to get to. When I found out we could now fly direct from Brisbane in 2.5 hours I booked our Jetstar Australia flights. We only had 5 days for a short getaway but the morning direct flight meant we didn’t waste any time getting out and exploring the city. It won’t surprise anyone that the number 1 item on my Hobart plan was a day on Bruny Island immersing ourselves in its food culture. 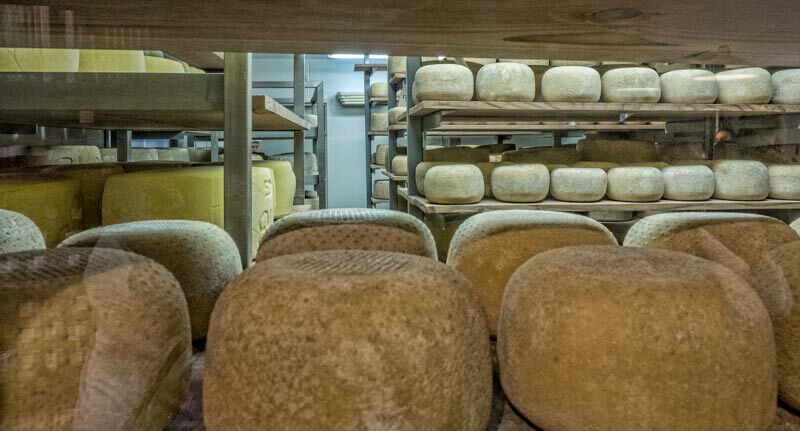 Bruny Island cheeses had me hooked at the Brisbane Good Food and Wine show a couple of years ago and I knew that we had to find out more about them, what they are up to now and the other artisan producers on the island. 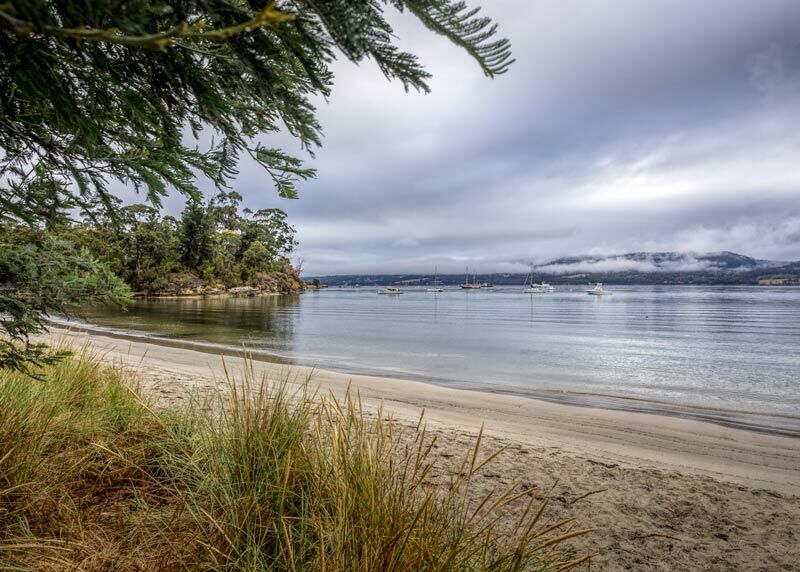 While you can visit the majority of producers on the island independently we decided to do the Bruny Island Traveller tour with Pennicott Adventure Journeys. We don’t do a lot of group tours but we do make an exception for food tours. Experience has shown us that their enduring relationship with the various wineries, producers and restaurants can really enhance the experience and open up the opportunity for conversations that add real value to the day. In this case we figured the long relationship of the Pennicott family with Bruny Island and its bounty would be a definite advantage and it was. The Pennicott base in Hobart is on Franklin wharf which is just across the road from the Hotel Grand Chancellor where we were staying but if you prefer not to walk across or are staying a bit further from the waterfront they do pickups at the various CBD hotels. They Bruny tour uses 20 seater buses which are easier to maneuver on the islands narrow roads and from a guest perspective I prefer a smaller group tour, there were only 11 of us on the bus the day we went but at some of the destinations such as the vineyard for lunch we met up with a second bus. Tim was our guide for the day and was perfectly suited to his role, a local who knows this part of Tasmania inside out, can keep the information and banter flowing through the full 9 hour tour and at the same time keep a bus load of excited foodies in check, a task somewhat comparable to herding cats. We headed off from Hobart around 8 am, I’d grabbed a cuppa to go from a nearby cafe on the way across to sip on the bus but our first coffee stop wouldn’t be far away at the ferry stop. On the way down Tim kept us entertained with history and anecdotes from the area and a short stop at the local beach at Snug, you don’t have to go far from the city to find gorgeous coastline. The ferry crossing at Kettering is a 40 minute drive from Hobart and the crossing is around 20 minutes on the vehicular ferry. There’s no public transport on the island so you need your own vehicle or to join a tour as we did. Despite the early cloud it cleared to a gorgeous sunny day and the crossing both ways was flat and calm. If making the trip independently the ferry runs from 7.30 am with the last return crossing departing at 7.15 pm. It costs $33 for a private vehicle and and $70 each way if towing a boat or caravan. We started off at the place that sparked my foodie interest in Bruny island years ago. Nick Haddow set himself up making cheese on the island in 2001. At that time the island didn’t have the tourist attention it has now and setting up a cheesery somewhere with not much rain and a big sheep station but no dairy herd probably seemed quite ambitious. Nick’s vision to be a premium artisan cheese maker far outweighed the constraints, he’s achieved great success including being the first cheese-maker in Australia approved to make raw cheese. The raw milk C2 is delicious, it’s a hard cheese formed into large wheels with a natural rind, the curds are still cooked when it’s produced but to a temperature below pasteurization. We can expect even bigger things to come with raw milk cheeses going forward, the business recently purchased a tiny dairy farm in the township of Glen Huon, it will run a small herd of specialist Dairy Shorthorns and Brown Swiss and in due course we hear it will be dedicated to raw production. I can’t wait to see what comes of that. Some other favorites from our tasting were George a mature firm cheese with a robust cheddar like flavor and Saint which is reminiscent of camembert, an oozy cheese with a light mold, I would love to try this one aged a little further to develop its pungency, I can see an order will be necessary and was interested to hear they are well set up for mail order dispatch. Another notable from our tasting board was ODO (one day old) is a fresh cheese marinaded in olive oil, chili, garlic and herbs it still tasted beautifully fresh and light without the clagginess (is that a word?) that marinaded cheese sometimes has. A final shout out to OTTO that I only got to see and not try but it might be the impetus to getting that order placed. It’s a fresh cheese thoroughly wrapped in a locally produced prosciutto, I’m imagining it as a summer supper baked in the oven and served with a crusty home baked bread and light salad. About this time I noticed Drew had moved on to testing out the new venture, Bruny Island Beer. Evan Hunter is the Brewer and he built the brewery with old milk vats and using 100% Tasmanian hops. There’s a variety of craft beers available to taste and purchase on site but we were both quite taken with the First Anniversary Braggott. It has the potential to be a bit potent at 12% alcohol but it’s blend of equal parts Tasmanian pale malted Westminster barley and Meander Valley Clover honey from Wellington Apiary is deliciously golden, mellow and malty. 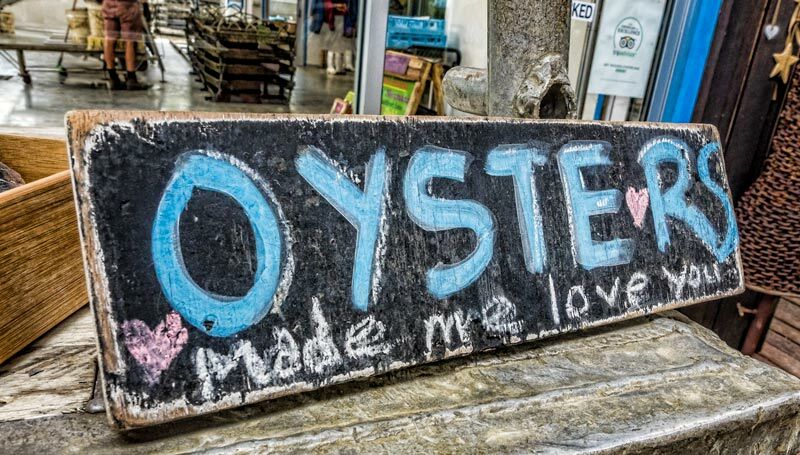 Something you quickly notice about the tour is that the tastings are generous, if you’re a lover of oysters au naturale, as we are, then this stop is pure paradise. 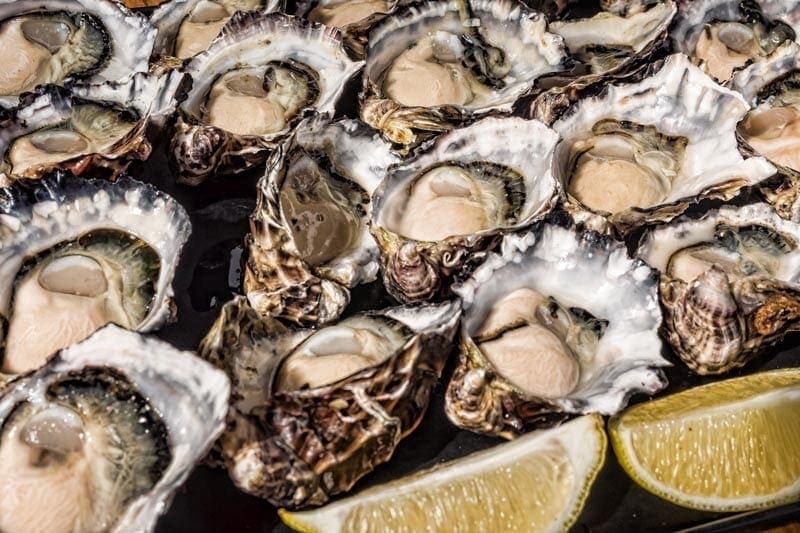 For our table of four we received a big wooden tray of 24 plump, juicy and creamy Miyagi oysters in their shell, wedges of lemon and 3 sauces on the side. We were told they wouldn’t be more than 2 hours from the ocean and they truly were the freshest and best, their briny goodness was divine! I thought we were in luck when one of our table of 4 didn’t like oysters leaving the other 3 to finish up the tray but when we finished we must have looked suitably appreciative of the experience and were handed extras on a fresh plate to feast on until it was time to move on to the next stop. Gluttony for sure but oh my they were so good. We didn’t exceed our capacity for oysters on the first pass though so when Tim kindly offered to stop there again on the way home and the use of the esky on the bus to keep them cold we ordered another dozen for supper. The Bruny Island berry farm was out next stop for morning tea and a walk on the nearby beach. I selected the Devonshire Tea with a chai latte, light fresh scones, clotted cream and home style berry jam while Drew opted for the berry muffins. If I’d known how much we would have already eaten by morning tea time I should have chosen the bowl of berries, they looked really good too. They cultivate a full range of berries here for purchase and the experience of picking your own. What berries are available and in what form will depend on the season you visit. Rounding us up from the beach Tim whisked us off towards Australia’s southern most vineyard, Bruny Island Premium Wines. This was the location for our days wine and cider tasting and also for our lunch, oh yes the eating continues ALL day. 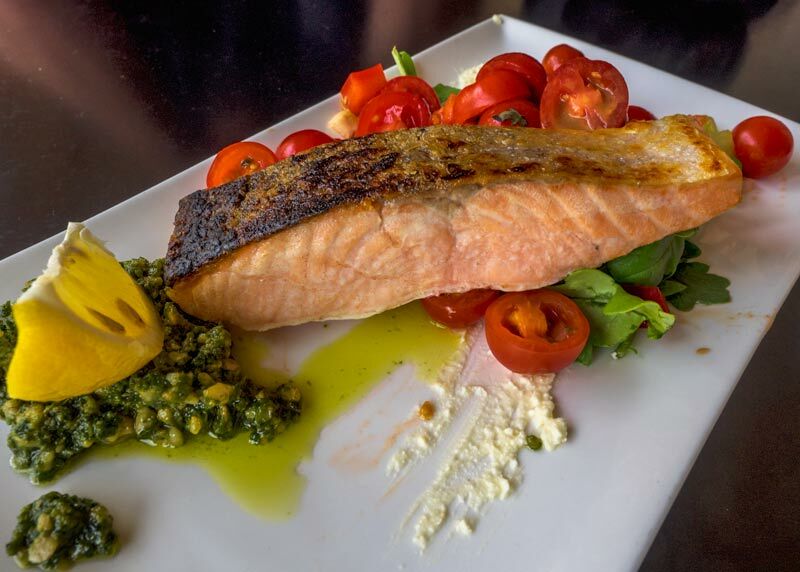 It’s a great spot and serves up delicious local fare, our tour selected from 3 options, we choose the salmon and lamb and both were perfectly cooked, simply prepared with the best quality ingredients. We met Natalie of Bruny Island Honey at their shop on the island although they also sell through markets and retail outlets. It’s a family venture and they’ve been collecting honey on the island for over 20 years and now have around 800 hives they’re operating. The hives are moved around to follow the nectar and there’s an opportunity to taste and compare several different types in the shop aswell as two honey mustard combinations and some honey based skincare. As part of the tour we received a small gift jar and got to pick our faves, Leatherwood from Mount Mangana and the less specific but deliciously flavoured Bush Honey. 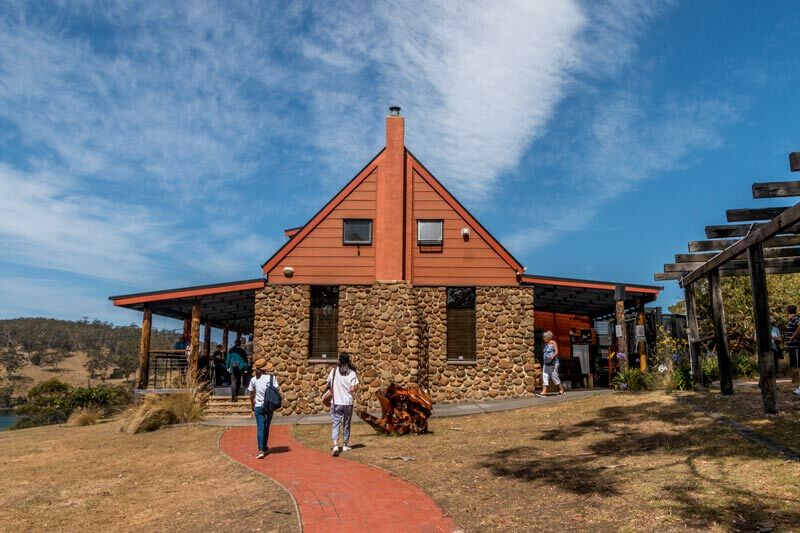 The Bruny Island Chocolate company is a family owned and operated business in south Bruny near the turnoff to Adventure Cove. There’s a small shop with that offers tastings and a good selection of packaged fudge and chocolates for purchase. This was a stop that we met up with the second bus on our tour and both drivers set to work chopping up an armful of different fudges for us to try. Our last stop for the day on the way back to the ferry was the House of Whisky. If you’re a fan of whisky and supporter of the local craft then the House of Whisky is a place you need to go, it has the most extensive collection of purely Tasmanian single malts and every one of them is on tasting including limited releases and special editions. What I wasn’t expecting was the 46 gins also on the bar including the Seclusion Limited Release, Bruny Islands own bespoke gin. On a hot day the addition of saffron to the botanicals creates a crisp and refreshing drink and I’d day I’m a convert. Sitting out on their porch overlooking the bay in late afternoon with a gin and tonic in hand is a great way to end the day but it can’t have been easy to get us rounded up and back on the bus in time for the ferry. Not surprisingly Bruny Island is surrounded by the most beautiful beaches and even on a holiday long weekend they were basically deserted. These remind me so much of the New Zealand beaches we grew up on and I’d love to return here and spend some time just enjoying them and the solitude. It’s iconic and everyone has the photo but that’s because it’s just so beautiful. The Neck Lookout sits on top of the hillock on the sandy isthmus that connects north and south Bruny Island. Climb the 238 steps and you’ll have the most stunning 360 degree views. The steps not only provide an easy way to the top but protect the fragile eco-system that houses the burrows of fairy penguins and muttonbirds within the hillock. 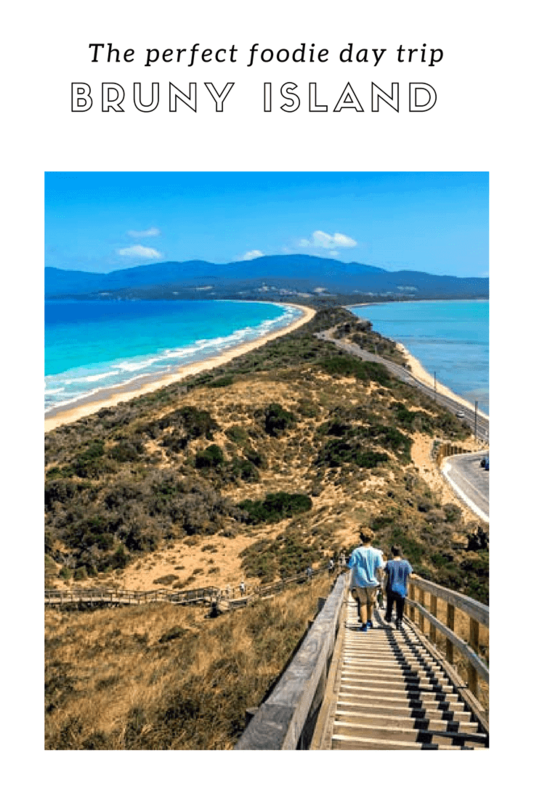 The photo at the top of the page shows the view to south Bruny while the one immediately above looks north and slightly east. 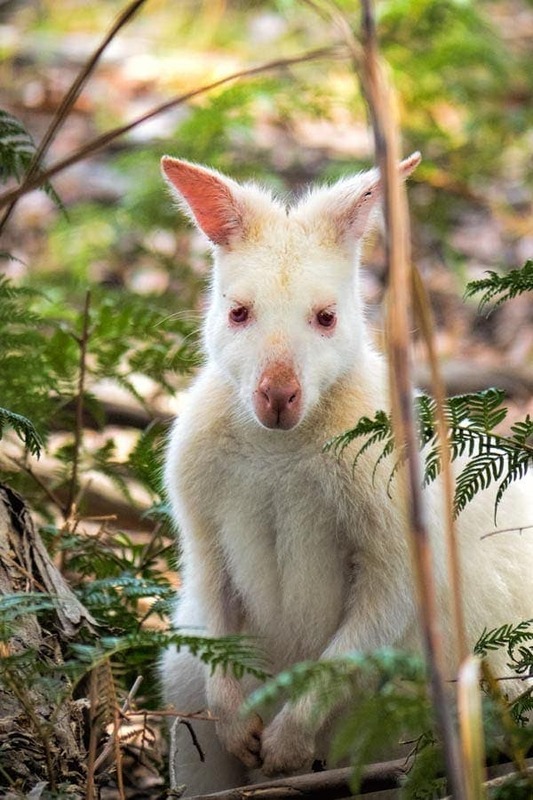 The best known and eagerly watched for wildlife on Bruny Island are the white wallabies, some of which are albino. 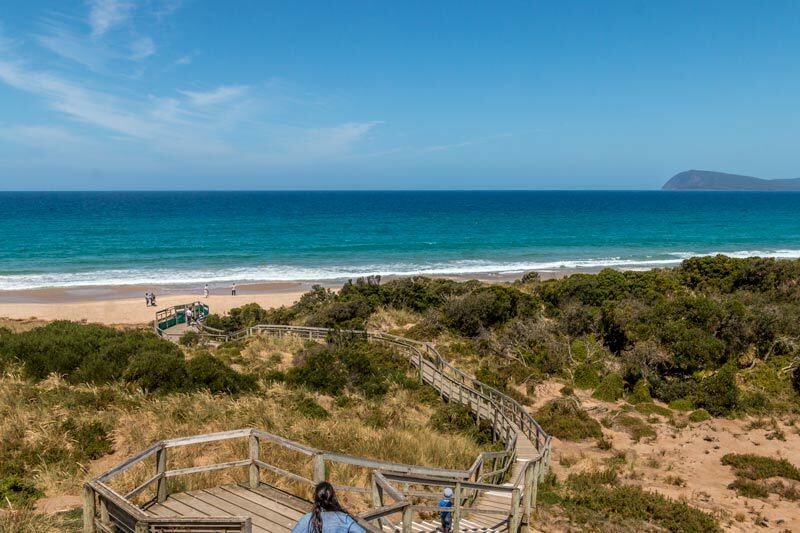 It’s a genetic trait that has been passed on within the relatively small community although at half the size of Singapore, Bruny Island isn’t exactly tiny, just minimally populated. We had hoped but didn’t really expect to spot one ourselves so we were thrilled to see not one but two during the course of the day. 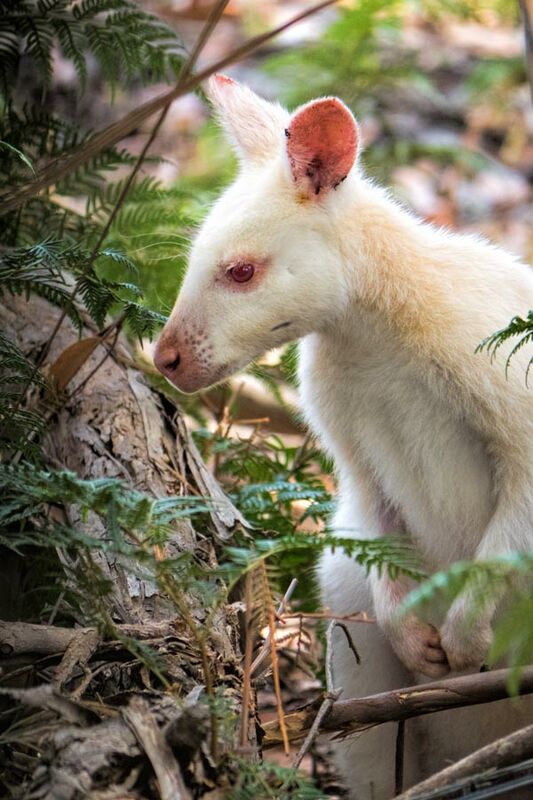 The first one was on private land and could only be seen at a distance and through the fence, the second one however was out in the open and was happy to sit there for quite some time and be photographed and admired. Bruny island is also a place to spot some rare birds including the 40 spotted pardalote, the swift parrot, mutton birds nesting and albatross. Around the coast you might also see fur and elephant seals, penguins, dolphins and whales. 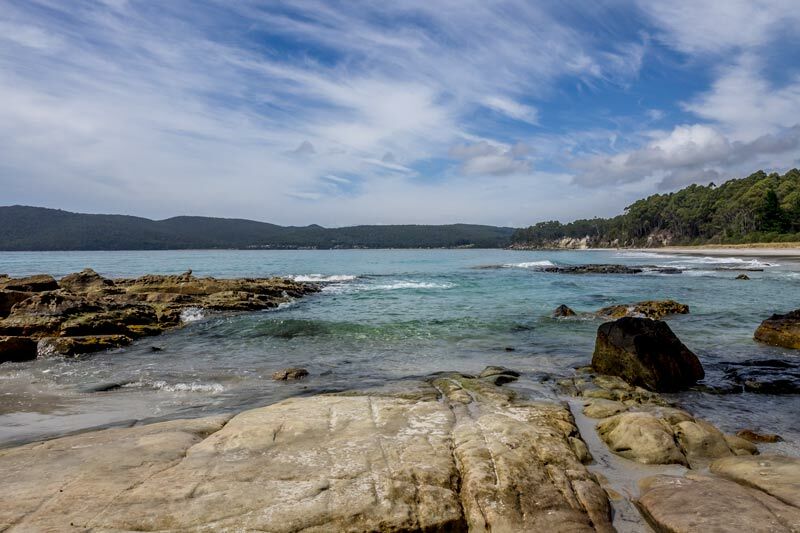 Bruny Island, like much of Tasmania is absolutely stunning, it really is a paradise. 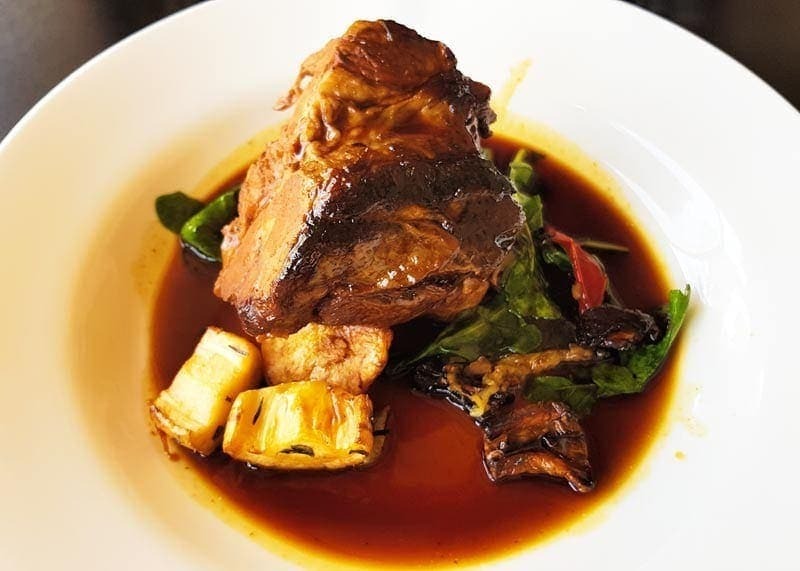 I’d been hearing for so long what a foodie destination it was that I was prepared to be slightly disappointed but every one of the artisan producers we visited was really good quality product, generous samples or portions and had a great local story behind them. We’ll definitely head over there again next time we’re in Tasmania and if you only have a day to spend this is a great way to fit as much as you possibly can into the time without feeling rushed or like you are missing out on something. Honestly this is one of the best tours we have done. While we didn’t have time this trip we also want to do one of the Pennicotts Wilderness boat trips, either Bruny Island or the Tasman Peninsula next time, we saw the boats for that as we got off the cruise at Port Arthur, just having had that short time out of the water gave a brief taste of what a spectacular coastline there is to explore there. Where to stay in Hobart: Our pick is the Hotel Grand Chancellor, it’s location right on the waterfront opposite Victoria Dock is central for all the harbour and city restaurants and attractions. The rooms are a good size, modern and the harbour view rooms are an affordable option that we felt were well worth it for those stunning sunrises. 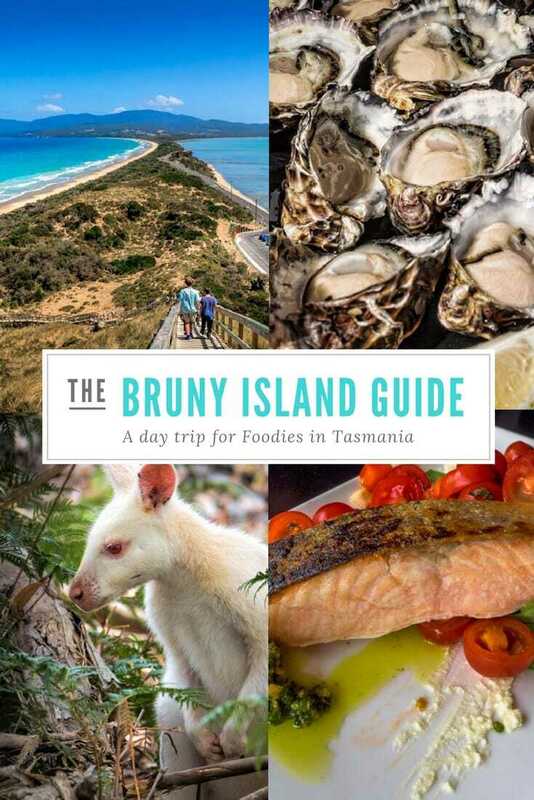 Have you been to Bruny Island? If you have any tips to add for first time visitors please do leave your ideas in the comments below. If you’re in the process of planning your trip and have any questions, please ask. We flew to Tasmania with Jetstar Australia as part of our partnership and participated in the Bruny Island Traveller tour as guests of Pennicott Journeys. Hi I am now going to Hobart on my own, do you think the gourmet food tour would be ok if alone? Hi Deborah, with any tour it will depend on your group on the day to some degree but it’s a small group tour and we had ours was very friendly and engaged. The guide was extremely good and got everyone interacting so I think it is one I would be very comfortable booking and doing on my own personally.